Dermal fillers are injectable substances used for skin rejuvenation. They are injected beneath the skin and can reduce wrinkles, plump up areas where volume has been lost and improve the overall contour of the skin. The most popular dermal fillers used to improve the facial appearance of patients are made from hyaluronic acid. Hyaluronic Acid (HA) fillers are a great choice when trying to add volume to sunken cheeks, thinning lips, darkened or hallowed areas beneath the eyes and to add definition to a slack jaw line. It can also be used to fill areas such as the creases that form at the corners of the mouth which are called the marionette lines. Hyaluronic acid is compatible with the body since it is a natural substance which already resides in the human body. Within the body, hyaluronic acid operates like a network which transports nutrients from the bloodstream to the skin cells. Besides being found in skin tissue, HA can also be found in the lips, tendons, ligaments, bones, cartilage and joint fluids. It is also very prominent in the soft connective tissues and in the fluid encasing the eyes. This viable substance can be extracted, reformulated and used to keep skin hydrated and plump. When the HA carbohydrates are not bound to other molecules, they will connect to water and lubricate the movable parts in the body such as the muscles and the joints. The carbohydrates form a stiff and sticky consistency much like Jell-O. 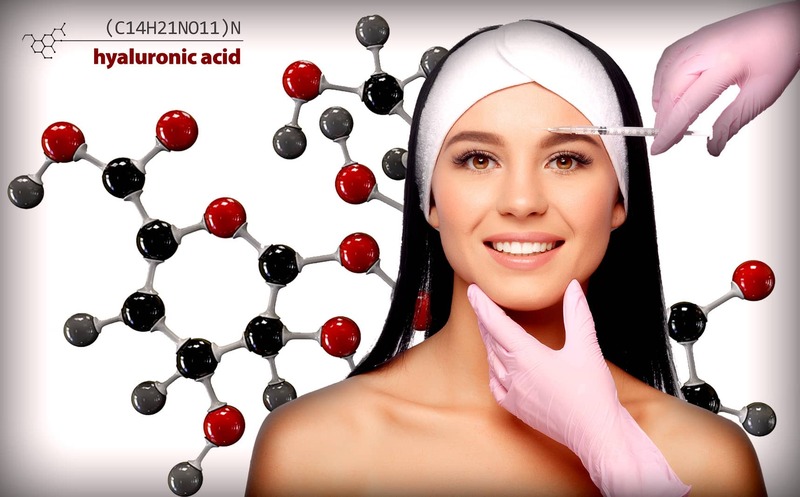 Hyaluronic acid has been successfully used in the medical field for many years. Some doctors use hyaluronic acid fillers in patients who suffer from arthritis to help ease pain by providing lubrication for ease of mobility. When the filler is injected into the joints, it provides extra cushioning. In 2003, the FDA approved hyaluronic acid fillers for cosmetic usage. When used to treat volume loss and wrinkles, HA acts like an inflated cushion to plump the skin and smooth out the wrinkles. Hyaluronic acid fillers also draw water to the surface of the skin in order to maintain hydration and softer skin. There are many different brands of hyaluronic acid fillers since they come in a variety of consistencies. Some of the most popular brands of HA fillers include Juvederm, Perlane, Restylane, Prevelle, Hylaform and Radiesse. Patients do not usually need an allergy test prior to HA injections because hyaluronic acid fillers do not generally cause an allergic reaction. Some patients may experience some mild swelling, redness and soreness at the injection site but this is normal and will soon subside. Bruising and small nodules under the skin are two side effects which can occur with dermal fillers. In rare cases, a patient may develop skin cell death, nerve paralysis or blindness after injections. However, this risk can be minimized by using a board-certified dermatologist or plastic surgeon that specializes in dermal fillers and performs them on a regular basis. Hyaluronic acid filler injections do not require any recovery or downtime. They are performed in a doctor’s office and patients can return to normal activities directly after their injections. The results from HA fillers are immediate and this is especially true when injected as a volume enhancer. For wrinkles, the skin will appear smoother but the improvements will continue to progress over a period of a few days as the skin becomes smoother. The fillers can last anywhere from 6 to 12 months or longer depending on how quickly the body breaks down the components and the location of where the filler is injected. Fillers injected in places of motion tend to lose their results quicker. However, fillers placed in superficial locations or locations such as below the eye can last much longer. Since HA naturally occurs in the body, it is broken down and traditionally absorbed within the body. The fact that there are no adverse effects suggests that long term usage does not have any detrimental impact on the body.